Captain James Cook visited the islands on January 18, 1778, and named them the "Sandwich Islands" in honor of John Montagu, 4th Earl of Sandwich, who was one of his sponsors as the First Lord of the Admiralty. This name was in use until the 1840s, when the local name "Hawaii" gradually began to take precedence. The Hawaiian Islands have a total land area of 6,423.4 square miles (16,636.5 km2). Except for Midway, which is an unincorporated territory of the United States, these islands and islets are administered as Hawaii—the 50th state of the United States. The eight main islands of Hawaii (also called the Hawaiian Windward Islands) are listed here. All except Kahoolawe are inhabited. This chain of islands, or archipelago, developed as the Pacific Plate moved slowly northwestward over a hotspot in the Earth's mantle at a rate of approximately 32 miles (51 km) per million years. Thus, the southeast island is volcanically active, whereas the islands on the northwest end of the archipelago are older and typically smaller, due to longer exposure to erosion. The age of the archipelago has been estimated using potassium-argon dating methods. From this study and others, it is estimated that the northwesternmost island, Kure Atoll, is the oldest at approximately 28 million years (Ma); while the southeasternmost island, Hawaiʻi, is approximately 0.4 Ma (400,000 years). The only active volcanism in the last 200 years has been on the southeastern island, Hawaiʻi, and on the submerged but growing volcano to the extreme southeast, Loʻihi. The Hawaiian Volcano Observatory of the USGS documents recent volcanic activity and provides images and interpretations of the volcanism. Kīlauea has been erupting nearly continuously since 1983. 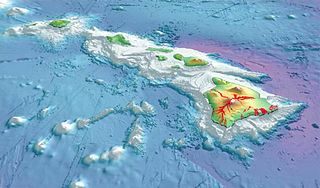 Hawaiʻi island (the Big Island) is the biggest and youngest island in the chain, built from five volcanoes. Mauna Loa, taking up over half of the Big Island, is the largest shield volcano on the Earth. The measurement from sea level to summit is more than 2.5 miles (4 km), from sea level to sea floor about 3.1 miles (5 km).. The Hawaiian Islands have many earthquakes, generally caused by volcanic activity. Most of the early earthquake monitoring took place in Hilo, by missionaries Titus Coan, Sarah J. Lyman and her family. From 1833 to 1896, approximately 4 or 5 earthquakes were reported per year. Hawaii accounted for 7.3% of the United States' reported earthquakes with a magnitude 3.5 or greater from 1974 to 2003, with a total 1533 earthquakes. Hawaii ranked as the state with the third most earthquakes over this time period, after Alaska and California. A tsunami resulting from an earthquake in Japan hit the islands on March 11, 2011. It was relatively minor, but local officials ordered evacuations in preparation for a possible major event. 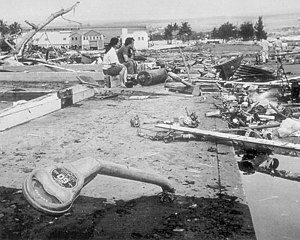 The tsunami caused about $30.1 million in damages. The islands are home to many endemic species. Since human settlement, first by Polynesians, non native trees, plants, and animals were introduced. These included species such as rats and pigs, that have preyed on native birds and invertebrates that initially evolved in the absence of such predators. The growing population of humans has also led to deforestation, forest degradation, treeless grasslands, and environmental degradation. As a result, many species which depended on forest habitats and food became extinct--with many current species facing extinction. As humans cleared land for farming, monocultural crop production replaced multi-species systems. The arrival of the Europeans had a more significant impact, with the promotion of large-scale single-species export agriculture and livestock grazing. This led to increased clearing of forests, and the development of towns, adding many more species to the list of extinct animals of the Hawaiian Islands. As of 2009[update], many of the remaining endemic species are considered endangered. On June 15, 2006, President George W. Bush issued a public proclamation creating Papahānaumokuākea Marine National Monument under the Antiquities Act of 1906. The Monument encompasses the northwestern Hawaiian Islands and surrounding waters, forming the largest marine wildlife reserve in the world. In August 2010, UNESCO's World Heritage Committee added Papahānaumokuākea to its list of World Heritage Sites. On August 26, 2016, President Barack Obama greatly expanded Papahānaumokuākea, quadrupling it from its original size. The climate of the Hawaiian Islands is tropical but it experiences many different climates, depending on altitude and weather. The islands receive most rainfall from the trade winds on their north and east flanks (the windward side) as a result of orographic precipitation. Coastal areas in general and especially the south and west flanks or leeward sides, tend to be drier. 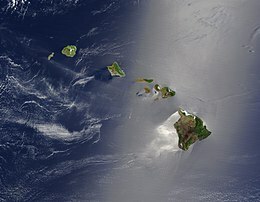 In general, the lowlands of Hawaiian Islands receive most of their precipitation during the winter months (October to April). Drier conditions generally prevail from May to September. The tropical storms, and occasional hurricanes, tend to occur from July through November. ^ McDougall, IAN; Swanson, D. A. (1972). "Potassium-Argon Ages of Lavas from the Hawi and Pololu Volcanic Series, Kohala Volcano, Hawaii". Geological Society of America Bulletin. Geology Society of American Bulletin. 83 (12): 3731–3738. doi:10.1130/0016-7606(1972)83[3731:PAOLFT]2.0.CO;2. Retrieved 2011-01-17. ^ "Petrography and K-Ar Ages of Dredged Volcanic Rocks from the Western Hawaiian Ridge and the Southern Emperor Seamount Chain". 86 (7). Geology Society of America Bulletin. 1975: 991–998. doi:10.1130/0016-7606(1975)86. Retrieved 2011-01-17. Midway Atoll is a 2.4-square-mile (6.2 km2) atoll in the North Pacific Ocean at 28°12′N 177°21′W. Midway is roughly equidistant between North America and Asia. Midway Atoll is an unorganized, unincorporated territory of the United States. Midway continues to be the only island in the Hawaiian archipelago that is not part of the state of Hawaii. Unlike the other Hawaiian islands, Midway observes Samoa Time, which is one hour behind the time in the state of Hawaii. For statistical purposes, Midway is grouped as one of the United States Minor Outlying Islands. The Midway Atoll National Wildlife Refuge, encompassing 590,991.50 acres (239,165.77 ha) of land and water in the surrounding area, is administered by the United States Fish and Wildlife Service (FWS). The refuge and most of its surrounding area are part of the larger Papahānaumokuākea Marine National Monument. Hawaiʻi is the largest island located in the U.S. state of Hawaii. It is the largest and the southeasternmost of the Hawaiian Islands, a chain of volcanic islands in the North Pacific Ocean. 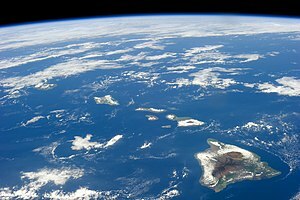 With an area of 4,028 square miles (10,430 km2), it has 63% of the Hawaiian archipelago's combined landmass, and is the largest island in the United States. However, it has only 13% of Hawaiʻi's people. The island of Hawaiʻi is the third largest island in Polynesia, behind the two main islands of New Zealand. Kāneʻohe Bay, at 45 km², is the largest sheltered body of water in the main Hawaiian Islands. This reef-dominated embayment constitutes a significant scenic and recreational feature along the northeast coast of the Island of Oʻahu. The largest population center on Kāneʻohe Bay is the town of Kāneʻohe. Kure Atoll or Ocean Island is an atoll in the Pacific Ocean 48 nautical miles beyond Midway Atoll in the Northwestern Hawaiian Islands at 28°25′N 178°20′W. The only land of significant size is called Green Island and is a habitat for hundreds of thousands of seabirds. A short, unused and unmaintained runway and a portion of one building, both from a former United States Coast Guard LORAN station, are located on the island. Politically it is part of Hawaii, although separated from the rest of the state by Midway, which is a separate unorganized territory. Green Island, in addition to being the nesting grounds of tens of thousands of seabirds, has recorded several vagrant terrestrial birds including snow bunting, eyebrowed thrush, brambling, olive-backed pipit, black kite, Steller's sea eagle and Chinese sparrowhawk. The Pearl and Hermes Atoll is part of the Northwestern Hawaiian Islands, a group of small islands and atolls that form the farthest northwest portion of the Hawaiian island chain. The atoll consists of a variable number of flat and sandy islets, typically between five and seven. More were noted in historical sources but have since been lost to erosion and rising sea levels. Nā Mokulua are two islets off the windward coast of Oahu in the Hawaiian Islands. They are also commonly known as "The Mokes" or the "Twin Islands". The islets are often photographed, and are located about 0.75 miles off Lanikai, a neighborhood of Kailua, Hawai‘i. Papakōlea Beach is a green sand beach located near South Point, in the Kaʻū district of the island of Hawaiʻi. It is one of only four green sand beaches in the world, the others being Talofofo Beach, Guam; Punta Cormorant on Floreana Island in the Galapagos Islands; and Hornindalsvatnet, Norway. It gets its distinctive coloring from olivine sand eroded out of the enclosing volcanic cone. The Hawaiian–Emperor seamount chain is a series of volcanoes and seamounts extending across the Pacific Ocean. The chain has been produced by the movement of the ocean crust over the Hawaiʻi hotspot, an upwelling of hot rock from the Earth's mantle. As the oceanic crust moves the volcanoes farther away from their source of magma, their eruptions become less frequent and less powerful until they eventually cease to erupt altogether. At that point, erosion of the volcano and subsidence of the seafloor cause the volcano to gradually diminish. As the volcano sinks and erodes, it first becomes an atoll island and then an atoll. Further subsidence causes the volcano to sink below the sea surface, becoming a seamount and/or a guyot. This list documents the most significant volcanoes in the chain, ordered by distance from the hotspot; however, there are many others that have yet to be properly studied. 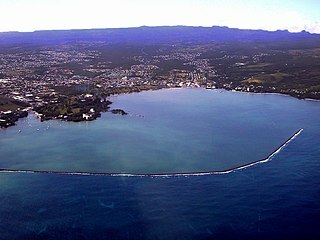 Hilo Bay is a large bay located on the eastern coast of the island of Hawaiʻi. The following is a list of islands of Hawaii. The state of Hawaii, consisting of the Hawaiian Islands, has the fourth-longest ocean coastline of the 50 states at 750 miles (1,210 km). It is the only state that consists entirely of islands with 6,422.62 mi² (16,635 km²) of land. The Hawaiian Island archipelago extends some 1,500 miles (2,400 km) from the southernmost island of Hawaiʻi to the northernmost Kure Atoll. Despite being within the boundaries of Hawaii, Midway Atoll, comprising several smaller islands, is not included as an island of Hawaii, because it is classified as a United States Minor Outlying Islands and is therefore administered by the federal government and not the state. On May 4, 2018, an earthquake with a magnitude of Mw 6.9 struck Hawaii island in the Hawaii archipelago at around 12:33 p.m. local time. The earthquake's epicenter was near the south flank of Kīlauea, which has been the site of seismic and volcanic activity since late April. According to the United States Geological Survey the quake was related to the new lava outbreaks at the volcano, and it resulted in the Hilina Slump moving about two feet. It was the largest earthquake to affect Hawaii since the 1975 earthquake, which affected the same region, killing two people and injuring another 28. The Honolulu Volcanics form a volcanic field on the island of Oahu, Hawaii, more specifically in that island's southeastern sector and in the city of Honolulu. It is part of the rejuvenated stage of Hawaiian volcanic activity, which occurs after the main stage of volcanic activity that on Oahu built the Koʻolau volcano. These volcanoes formed through dominantly explosive eruptions and gave rise to cinder cones, lava flows, tuff cones and volcanic islands. Among these are well known landmarks such as Diamond Head and Punchbowl Crater.